EPFL scientists have mapped out the steps required to build a self-sustaining research base on Mars that would be habitable for the long term. Their work can help researchers set priorities for space programs exploring Mars as well as the solar system as a whole. If there was ever life on Mars, its traces are most likely to be found at the planet's poles. Or more specifically, in its polar layered deposits, which are layers of ice and dust that have built up over thousands of years. So, according to a team of EPFL scientists, the poles would be the most logical place to set up a research base and, potentially, colonies. 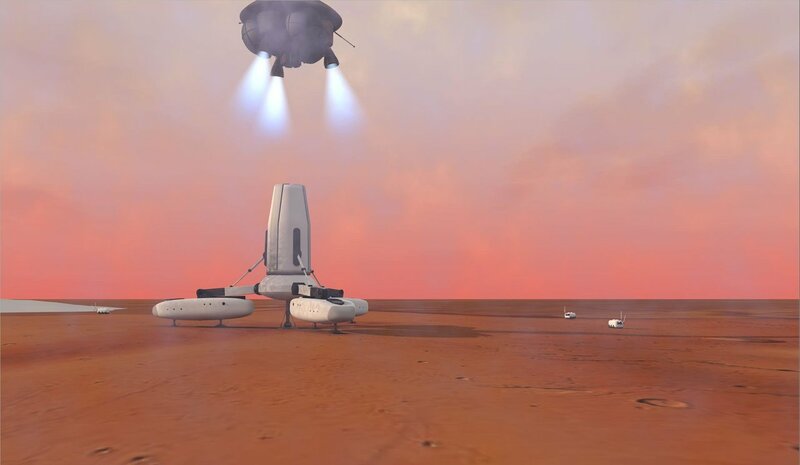 This team has mapped out a step-by-step strategy along with the required technology to build a research base on Mars that would be self-sustaining and that could accommodate a long-term manned presence. The results of their work will soon be published in Acta Astronautica and is being presented today at the Entretiens Internationaux du Tourisme du Futur conference in Vixouze, France. "The poles may pose more challenges in the beginning, but they are the best location for the long term since they harbor natural resources that we may be able to use," says Anne-Marlene Rüede, lead author of the study and a student minoring in Space Technology at EPFL's Space Engineering Center (eSpace). And even though the scientists are thinking well into the future – colonies that would be developed over several generations – they still went into great detail in their design. "We wanted to develop a strategy based on technologies that have been selected accordingly and outline a test scenario so that 20 years from now, astronauts will be able to carry out this kind of space mission," she adds. The EPFL scientists' strategy involves sending a six-person crew to Mars' north pole during the polar summer, to take advantage of the 288 days of continuous light, and then return them safely to Earth. The first novel element of their strategy is that it would take place in two phases. First, robots would be sent up to build a minimal living space for the crew and to test the natural resources available on site. Then the crew would be brought in. This approach would minimize the payload that space shuttles would have to carry and make the mission as safe as possible for the crew members. However, engineers have yet to develop rockets that can handle 110 metric tons of equipment. So that the research base can sustain a manned presence for nine months – and eventually even longer – the plan is to make maximum use of the natural resources found on Mars, first and foremost water. The discovery of ice at the poles means the base could theoretically produce water, oxygen and nitrogen – compounds essential for human life. Other chemicals in Mars' air (especially CO2) and soil (like silicon, iron, aluminum and sulfur) could potentially be used to make materials such as bricks, glass and plastic, or even fuels like hydrogen and methanol. All that would make the research base self-sustaining for the long haul. 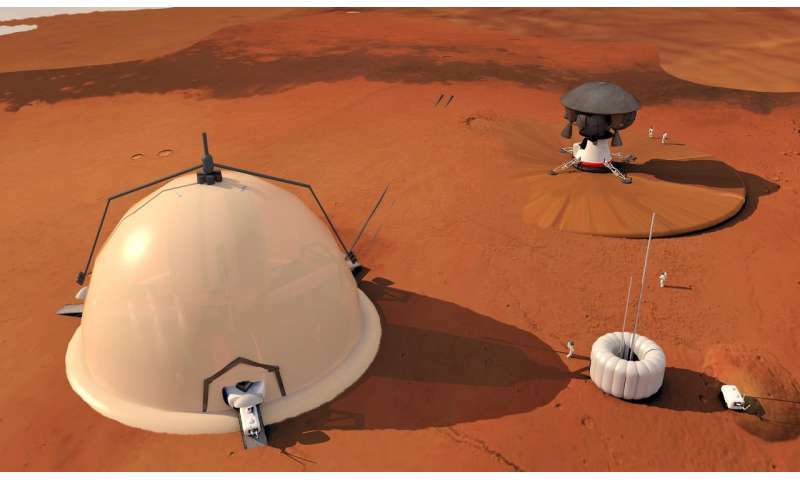 The research base would consist of three modules: a central core, capsules and a dome. The central core would be 12.5 meters high and five meters in diameter, and would house the minimal living space as well as everything the crew needed to live. The three capsules would be built around the minimal living space and serve as airlocks between that space and the exterior. Robots would set up these structures during the first phase of the mission. The dome would cover the entire base and would be made of polyethylene fiber covered with a three-meter thick layer of ice – creating a kind of igloo. The dome would also represent an additional living space, provide a second barrier to protect the crew against radiation and micrometeoroids, and help keep the pressure constant inside the base. 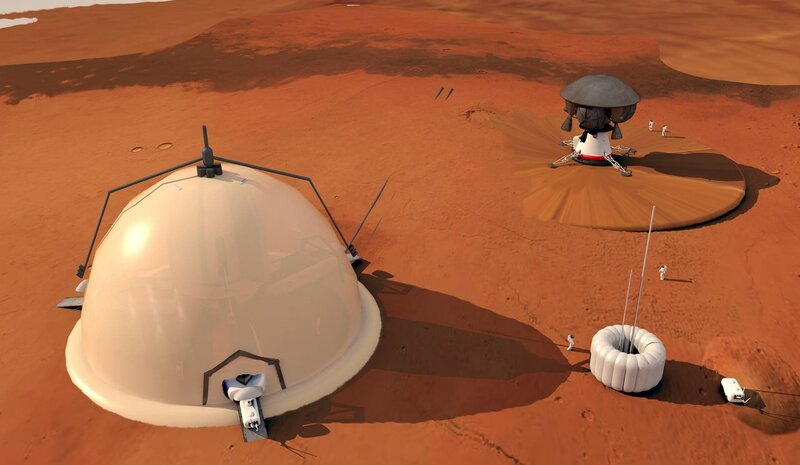 Another innovation in the scientists' plan is to create a crane system that would orbit around Mars and be launched during the second mission. This system would serve as a transfer point between space shuttles coming up from Earth and the research base on Mars. A special crane vehicle designed by the scientists would offload equipment from space shuttles onto Mars' surface. 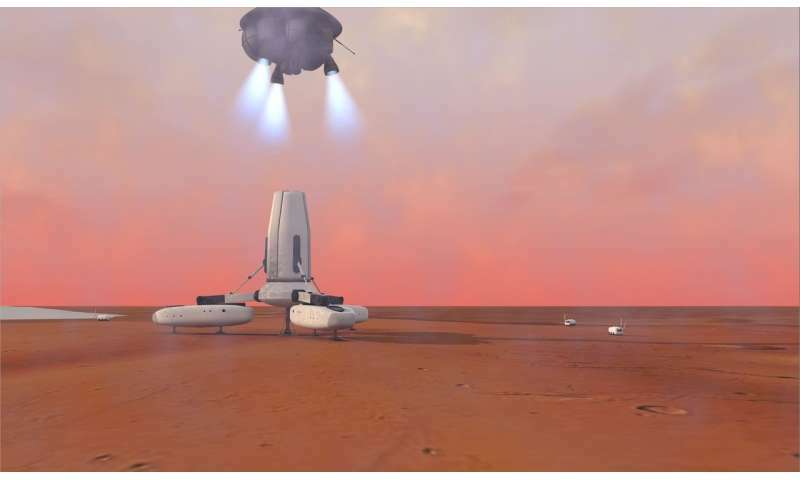 "The crane vehicle could be reused several times and would be powered by fuel produced on Mars. It would reduce the payload that space shuttles would have to carry up to the research base," says Claudio Leonardi, another scientist involved in the study. "The vehicle's docking system would be similar to that used on the International Space Station: once a shuttle was docked, the vehicle would unload the cargo and crew and set them down on Mars." What makes their vehicle design unique is that the engines are located above the vehicle's center of gravity and that the vehicle can be used for six missions. The fuel for the ascent would be made in situ and that for the descent would come from Earth. "We would need to conduct an initial mission to try everything out for the first time. And the better that initial mission is thought out, the faster we will be able to get things going and move on to colonization," says Anne-Marlene Rüede. In reality, the scientists have not taken a stance on the prospect of colonizing Mars. But one of the key benefits of this research is that the systems it envisions could be used for robotic missions in general, whether Martian, lunar, terrestrial or otherwise.